with your guests – instantly and remotely. No key required. We‘re expanding our products! — Visit our crowdfunding page. Smarke is specifically designed to meet the needs of property managers, hosts and guests on platforms such as Airbnb and HomeAway. With Smarke you can use your mobile to grant immediate access to your property – whether you‘re nearby or halfway around the world. Our keyless entry app gives you full control. You decide when guests are able to check in and check out of your property. Remote digital access makes life easier for you and its efficiency will impress your guests. 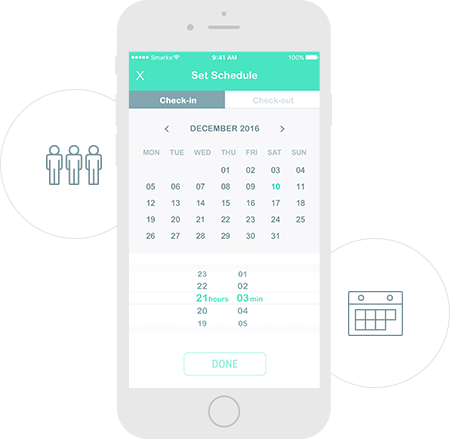 You grant access via the Smarke app to your guest‘s smartphone by specifying the dates and times of their visit. The guest can then grant access to other members of their party. 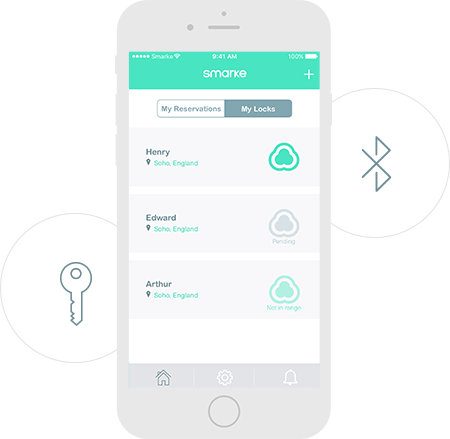 The Smarke app uses Bluetooth to unlock and lock the door; there‘s no need for an internet connection. Our device fits on any Euro Profile Cylinder lock. It takes just minutes to install. Smarke is battery operated so there‘s nothing to wire or connect. When the battery is running low (it lasts up to 6 months), you‘ll be alerted via the app. Our hardware is encrypted. So you can relax in the knowledge that only people you have authorised can use it. When will Smarke be available? Our team is working hard to launch Europe-wide, once beta testing is completed in the UK. What happens if my (or my guest's) phone battery dies? Our customer support team is available 24/7 in case of emergencies. Additionally, the Smarke entry system also works using your existing keys. Other contingency plans are in development. What is a Euro Profile Cylinder lock? It is one of the most commonly used locks because it offers versatility, functionality and security. These cylinders are easily and quickly adapted to the Smarke system. Sign up here and let's get started! Smarke is an ideal solution for Property Managers and Airbnb hosts who want to enjoy a keyless experience with their guests. A member of our team will contact you to schedule a quick call. This helps us decide whether you‘re elligible to be a Beta customer. Please make sure your contact details are correct. Copyright © 2019 Smarke Limited. All rights reserved. Smarke is not affiliated in any legal or commercial way to Airbnb or HomeAway.